In her opening address to WBC15 participants, Karen MacNeil passed on a bit of advice given to her when she was the wine and food editor of USA Today: "If you know your stuff, you should be able to explain it in 17 words." 1. Glaciers: Big walls of ice that receded from northern New York some 20,000 years ago, leaving behind a tasty soil mix of rock, minerals, shells and silt ... and a few big bodies of water closely resembling digital appendages. 2. Gaffer District: Restored historical section of downtown Corning named thusly in honour of the city's "gaffers" or master glassblowers. Trendy, pedestrian-friendly hub of boutiques, high-end eateries and Bottles n' Corks. 5. Riesling: Grape variety of choice here in the Finger Lakes. Winemakers have nailed both dry and off-dry styles in glorious, manna-from-heaven liquid gold. 6. Sakartvelo: Local name for the country of Georgia, where wine has been made for over 8,000 years in vessels called qvevri that are buried in the ground. Also part of the title of Terry Sullivan's book. 7. Michael Jackson: As Brandon Seager explained it in his session on cellaring wine, some things age better than others. 9. Vibrate: The setting your phone should be on when SOMEONE ELSE IS TALKING AT THE FRONT OF THE ROOM. 10. Bleep: The sound made about two seconds too late after Madeline Puckette's F-bombs during her lively, engaging and inspiring talk on wine blogging success. 11. Saperavi: 1) Grape of Georgian origin grown 2) Wine made from said grape and perfected by Finger Lakes' Standing Stone Vineyards. 12. Kavorka: 1) Latvian term popularized by "Seinfeld", meaning "the lure of the animal." 2) Something abundantly present at Table 12 during the awards gala. 14. 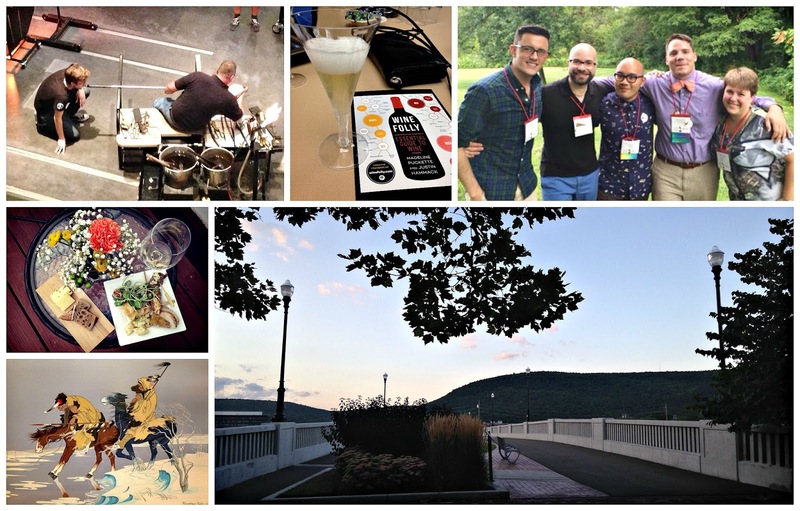 Awards: Actually having some of the Wine Blog Award winners present this year was nice. And kudos on the positive changes to the nomination and voting process. 16. Hybrids: Grapes that are NOT crappy, no matter what anyone says. 17. Badminton: the world championships in Indonesia may have had the same hashtag, but we OWNED IT. #booyah #thatjusthappened #WBC15 FTW. You managed to fit a lot of opinion into your 17 words! Good job.